The safe replacement of hydraulic hoses is something that should not be taken lightly. You need to make sure that you have the right tools and parts from your local hydraulic hose shop in Fall River. If you aren’t sure what size hose to get and whether you need hydraulic hose clamps or other accessories to make it fit properly, consider hiring professional Fall River hydraulic hose services to take care of it for you. A lot of the heavy equipment used in construction and other industries relies on a hydraulic system to operate. The system consists of a hydraulic pump, valve spools, and cylinders. Each of these components is connected with a series of tubes and hoses that serve as a conveyance tool for hydraulic oil. However, if the tubes and hoses become damaged or wear out, the oil can leak through the hoses, resulting in damage. Pressurized hydraulic oil and other hydraulic fluids can be extremely dangerous to the people who work with this equipment. They can also damage industrial equipment or cause slip-and-fall accidents in the workplace. Any leaks or damaged hoses need to be replaced right away. The first thing you need to do is locate the hose that needs to be replaced. Safe replacement of hydraulic hoses starts with identification. While some situations may cause the offending hose to be obvious, small pin-hole leaks and other types of damage can sometimes be difficult to see. Once you safely identify the proper hose, you can begin the process of determining how many components must also be removed and replaced to properly replace the hose. 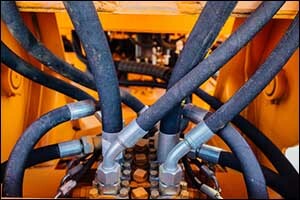 Hydraulic hose assemblies can include the hose, hydraulic hose clamps, and other elements, depending on the equipment. Guards, other hoses, hydraulic cylinders, and housings are just some of the other parts that might need to be removed or replaced. This can be an extremely important step, helping to avoid any further damage or injury. Check to see if the hydraulic component that is served by the hose or any connected components must also be removed or replaced. If there is still oil in the system that the hose is being disconnected from and it is under pressure, it could blow out under high-pressure and cause massive damage. All pressure should be relieved from the cylinders, components, and any other parts of the system before any Fall River hydraulic hose services are performed. Make sure that you get all of the tools that you will need to properly remove the hose. Don’t try to “fake it” with tools that aren’t meant for the job. You should also have the proper safety gear. Check the manufacturer’s recommendations or the safety guide at your workplace. There are different types of gloves and safety gear required based on the pressure and the fluid that is used in the equipment. Protect yourself and don’t just guess when it comes to safe replacement of hydraulic hoses. If you need hydraulic hoses in the Greater Fall River area, make sure to stop by Metro Industrial & Marine Supply. We have a wide selection hydraulic hose clamps, hoses, and hydraulic hose assemblies in standard sizes or custom sizes can be made while-you-wait. Stop by our hydraulic hose shop near Fall River and get everything you need for the safe replacement of hydraulic hoses. Since 2001, we have been a fixture in the City of New Bedford, providing top quality products and services to customers throughout Southeastern Massachusetts. We sell to individual consumers, businesses, contractors, organizations, and corporations at the local and international level. Our sales team has over 80 years of combined experience in industrial sales, which helps us to best serve all of your industrial and marine needs. Customer service is our top priority. We go above and beyond to meet the needs of our customers. That’s why we provide same-day service on most of our custom hydraulic hoses, and we stock a wide selection of domestic and foreign adapters, including British, JIS, and metric. Give us a call at 508-996-8400 or stop by our shop located on Coggeshall Street in New Bedford, MA. We are proud to have a large following of repeat customers and receive a lot of referrals from past and current customers. Stop by today and get hydraulic hose assemblies made while-you-wait at Metro Industrial & Marine Supply.